I went to this demo not really knowing what to expect. When I asked about the product, I was told it had patented technology to help improve tv quality. When I showed up and seen the demo by Founder and CEO Amine Chabane. I was defiantly blown away. The mCable is more of a mini computer, than it is a cable. That’s because it does more than a standard cable. I think that because you hear what it does, it is hard to believe it unless you can see it with your own eyes. This product was developed for one simple reason. To give consumers the opportunity to upgrade their quality of entertainment, without breaking the bank. The mCable is like none other. It is compatible with PlayStation PS3, PS4, Xbox, Nintendo Switch and most games. 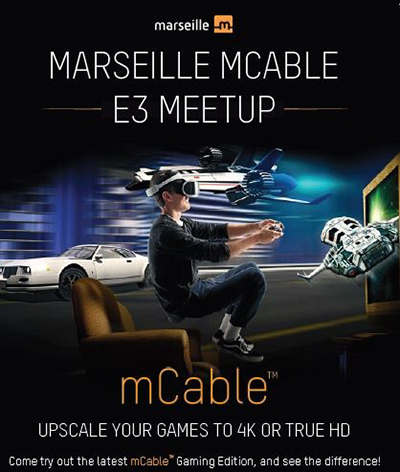 No additional hardware or software needed, mCable is a plug-and-play connector that instantly upgrade your favorite games. From 480p and 720p content, it upconverts to 1080p. For 1080p HD content upconverts to near-native 4K. No lag time – less than 1 millisecond processing per frame. Up to 120 FPS for 1080p games, including VR. The mCable improves image depth, contrast & color rendering. Analyzes every single pixel and adjusts it for the best image possible. This mCable is specially design for games. It has a proprietary CxAA algorithm created specifically to enhance and repair video game graphics. The mCable analyzes the placement of every single pixel in context to the entire image. Pixels are made of tiny squares. In real-life objects have rounded edges. This conflict cause the the content to look less sharp and jagged. This is solved by the mCable because it analyzes every single pixel in real-time and fills in the missing data between the straight square edges on a curve. Smoothing out edges and providing vivid colors from advanced anti aliasing and color correction algorithms in real-time. For anyone who has a regular tv that is looking to get amazing tv quality or tv game clarity. This product is defiantly a buy. The mCable improves picture quality so much, you wont believe your eyes.